HealthRider elliptical are quality fitness machines that range from $500 – $2000 USD. They are highly rated by consumers and experts alike. They have a variety of elliptical equipment that targets the different parts of your body. HealthRider H90e is designed to specifically target your glute area, quads, and calves with their unique technology called Target Toning, Power Ramp, and iFittm. The HealthRider Club Series H140e is designed for cast and electricity savings – very efficient for your home use. It incorporates the 15 Personal Trainer Workouts, One-touch resistance and Clearview technology for a more personal aerobic, weight loss or performance workout. You can customize your exercise program with HealthRider Stride Trainer 900. It uses iFitr Live which is a wireless connection between your equipment and the internet. It also employs an Intensity Stride Power Ramp which adjusts your stride and inclines for maximum workout intensity. It is also iPod compatible and has a built-in Cool Airetm system with One Touch controls. HealthRider may not be very well known as it is catered more for beginners, however, it actually s a subsidiary of ICON health and fitness – which is a leading brand and health and fitness care. Among ICON’s popular brands are Nordic Track, Weslo, Reebok, and Proform. Among its more popular features are its EKG Pulse Sensors, iFit Compatibility, and Power Ramp/Incline. EKG’s are basically heart monitor systems available in most HealthRider models. This is a great feature for beginners looking to be healthier through cardiovascular training. iFit is a personal training technology customized to your body’s needs that are accessed through an iFit card for better workout results. Power Ramp or incline is basically an increased variety and intensity in your workout by adding slopes to your cross-training exercises. This helps you burn more fats for a faster weight loss. Feel free to buy directly from the manufacturer to get better discounts. Since HealthRider is from ICON, you can expect highly diversified, high-quality equipment from top fitness engineers. They incorporate good quality value motors, rollers, and components in their equipment. HealthRider started out in the 80’s as one of the first elliptical lines produced in the market. They offer variety than your average treadmill at better prices. Their elliptical line combined cardiovascular workout with upper body arm workout for better weight loss results. It gives you the illusion that you are working less because of the reduced impact on your body although you are actually burning more calories and fats. The Healthrider 330 is a low-cost elliptical trainer that helps you burn calories, do cardiovascular exercises and tone your body, with low impact on your body. It has all the essential and basic features needed in an elliptical trainer and the 12 level resistance gives you efficiency in your workouts. It isn’t the best option for elliptical trainers’ enthusiasts, but it will fit the needs of new users. 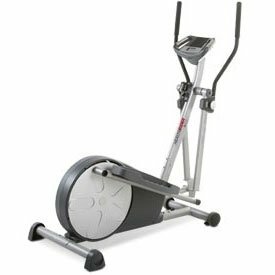 For the price you pay and the quality you get from the Healthrider 330, either you buy it to have the whole family exercising on it, and probably you will get problems and will need some maintenance, or if you are alone, better to enroll in a gym for a year and then buy a better elliptical trainer. 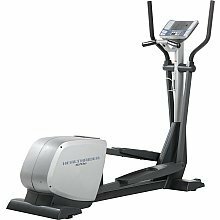 The Healthrider 330 Silent Magnetic Resistance gives you an elliptical motion while working out, increasing the efficiency of cardio exercises and reducing the damaging impact to your body. It has 12 levels of resistance, with 6 preset programs and 2 learn programs, which will be challenging to you whatever your fitness levels are. The blue backlit console displays all the essential information you need to monitor your workout sessions, while the EKG Heart Rate Monitors placed in the handles helps you to keep your heart rate in the right training zone. The Healthrider 330 has several limitations that will put some deals off, if not everyone. It is not suited for heavyweight users or elliptical trainers’ enthusiasts. For the price you pay for the Healthrider 330 you can expect lots of cheap plastic components and that it will be noisy. It has a weak warranty that only covers parts and labor for one year, considering the likelihood that parts on a budget machine like this will eventually break and need maintenance, the money saved may not be worth the investment on the long term. Plus, it has been noted in some reviews that the Healthrider 330 doesn’t have a comfortable ride and the pedal motion doesn’t give the user a good oval feel. Overall it doesn’t provide a solid performance and it falls behind many of its competitors at the same price range. If you are looking into buying a Healthrider 330 then it is time to stop and look at the options before any decisions, there are better options within the same price range and if you will be the only user then it would be better to just take advantage of first-class elliptical trainers in a gym. If you have been longing for a perfect elliptical that offers a cardio workout and an amazing body workout in a single package, your search ends with Healthrider H70e Elliptical. The HealthRider elliptical is a much durable machine that is available from Icon Fitness that boasts of a flawless design, a perfect feel, and simplistic workout programs. However, this seems an exception. On an average, it is the no-frills attached elliptical that just does what it should but on a lot of conditions to compromise. The Health Rider H70e is a complete package when it comes to design and durability. But, with limited features and absence of incline ramps, it faces a tough competition from the other under $1000 ellipticals available in the market. I bought this product on a Sat. and by Monday it was already broken. The set up was pretty straight foreward, however as soon as it was ready to use I got on it and it was making a baning noise which I could not fix. Then by Monday after work I got on it and the resistance wouldnt change 1 was the same as 10 so I took it apart to find that the tension motor was broken. I called the company and they said I had to bring it in to fix…I am returning the machine and getting my money back and buying a different elliptical. I would NOT purchase this machine!!! Was difficult to put together and components are poorly made and cheap.Once assembled machine shakes violently from side to side when used at ANY resistance level. Arms squeak and grind.Fan and heart rate monitor stopped working after two weeks.Does not come with a power cord and chews through batteries… This piece of junk is being returned to sports authority! Do not be tempted by the low price and avoid this machine at all costs! Now focussing on the positives, the machine does include 2 heart-rate workouts that automatically increase and decrease the resistance levels. The heart rate monitors or sensors are built into the handles to help you remain in the correct training paradigm set for your goals. Moreover, it feels and appears quite stable and solid even as your workout owing to its oversized pedals, an 18″ stride length, and the upper-body handlebars to help shape your arms. Would rather recommend looking for better options. Still, here’s a summary of all this elliptical has to offer. If you don’t need HealthRider H70e as your sole cardio exercise machine, this is a good choice for adding on to your home gym. However, the usage should be limited.